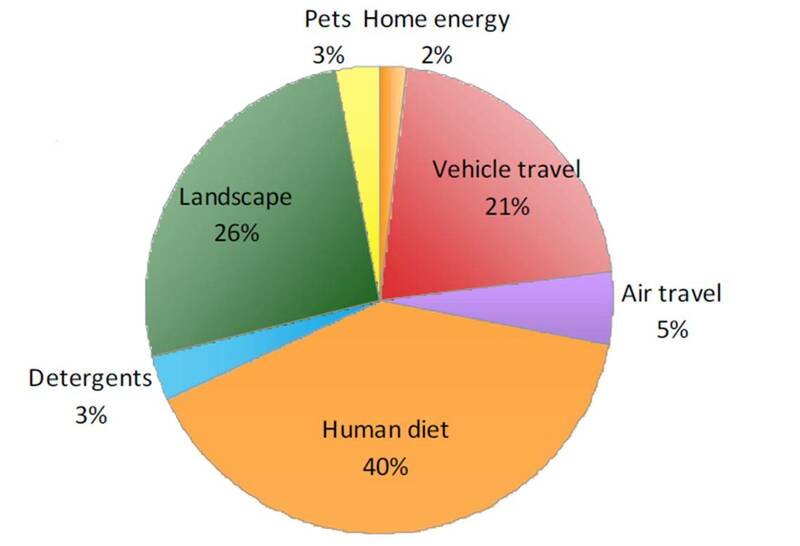 Sources of nitrogen from Twin Cities households. Like the water cycle and the carbon cycle, humans have completely transformed the nitrogen cycle, especially through our use of fertilizers. These changes to the nitrogen cycle have led to some undesirable impacts, like algae blooms in lakes, smog, acid rain, and climate change. Just like water cycles from the atmosphere to soil to groundwater, living creatures, streams, and the ocean, we can follow the cycles of other nutrients like carbon, nitrogen and phosphorus. Carbon, for instance, is found in all living things (carbohydrates, for example) as well as in methane and carbon dioxide gases in the atmosphere, in rocks like limestone, in fossil fuels like petroleum, and in many different forms in the ocean and soil. Carbon doesn’t just stay in one place or in one form–it goes from one place to another, often being transformed from one form to another. These cycles of nutrients, called biogeochemical cycles because they involve living things as well as rocks and sediments and the atmosphere, have been greatly impacted by humans. Most famously, human use of fossil fuels (coal, petroleum, and natural gas) has hugely accelerated the rate at which carbon buried in the earth is released to the atmosphere, mainly as carbon dioxide. The Twin Cities Household Ecosystem Project quantifies the cycling of carbon, nitrogen, and phosphorus through households in the Twin Cities. For example, the project found that three quarters of the nitrogen that moves through Twin Cities households comes from two sources: food and lawn fertilizers. For a short video examining the affect of Twin Cities pets on the local phosphorus cycle, see this website. You can calculate your household’s impact on the carbon, nitrogen, and phosphorus cycles at this website.